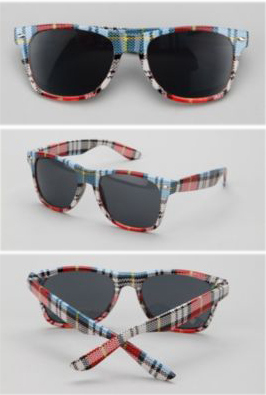 Because you can never have too many wayfarers, these plaid numbers from Urban Outfitters could very well complete the collection. Priced perfectly modestly, the DC plaid wayfarers are the ideal impulse buy on the first hot day of the year. Although not for everyone, these frames do work best with a toned down beachy outfit, sitting on the back of a speedboat. Available online. This entry was posted in Sunglasses and tagged Urban Outfitters. Bookmark the permalink.